The Battle of Lumbridge is the first Runescape "world event" released with Runescape 3 on July 22, 2013. Players were automatically teleported to the battle upon login to Runescape 3. It is the first weekly event in a series of battles that will span 10 weeks with a new challenge every week. 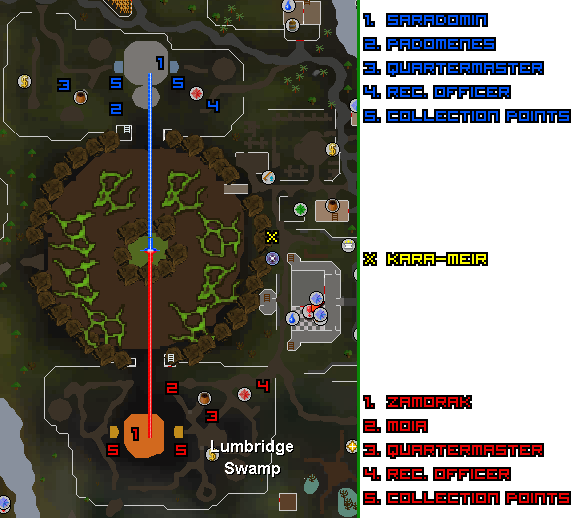 The battle explained the presence of a mysterious portal that had been increasing in size behind Lumbridge Castle. A cutscene that all players were required to watch showed that Zamorak used the portal to Gielinor. 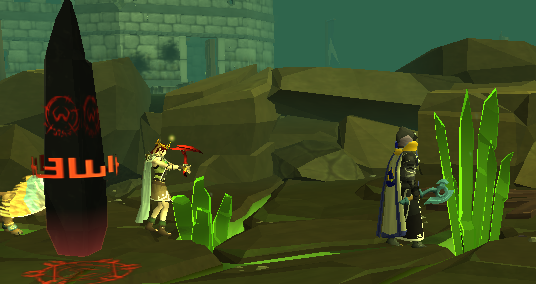 Saradomin appears shortly afterwards and the two begin to fight. While Saradomin and Zamorak are currently at a stalemate, their followers have taken the fight to the battlefield and can be seen running from their respective camps or teleported by their gods to random areas. 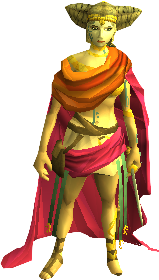 Kara-Meir can be found near the Lumbridge lodestone. Players do not need to talk to her to continue although talking to her will provide some background information as to what is going on. Note: If you missed the cutscene at the beginning or want to watch it again, you can see it again by speaking to Kara-Meir. 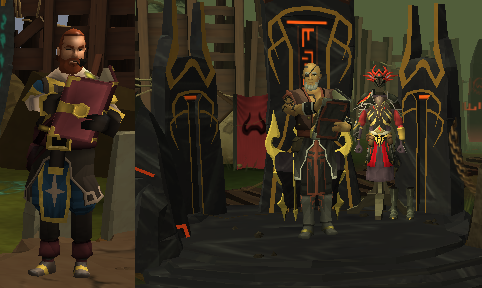 Players can choose a god to side with by heading over to either the Zamorakian or Saradomin encampment. Once players choose a side, they will be given a token of their god. Players can upgrade this token by collecting more Tears. The first upgrade to a Silver token requires 1000 tears. A Gold Token requires 2000 tears. A Runite Token requires 3000 tears. Players can switch sides, but they will lose their renown in doing so. The symbol of their chosen side will also be displayed above their character. Once a side is chosen, walking into the opposing side's camp will result in heavy damage! Note: You can disable the allegiance by clicking the quest icon and the "Battle of Lumbridge" tab and unchecking the Display Allegiance tick. Bronze Saradominist Token A bronze token from Saradomin. Silver Saradominist Token A silver token from Saradomin. Gold Saradominist Token A gold token from Saradomin. Small damage reduction from Zamorakian forces. Runite Saradominist Token A runite token from Saradomin. Small damage increase against Zamorakian forces. Dragon Saradominist Token A dragon token from Saradomin. Moderate damage reduction from Zamorakian forces. Moderate damage increase against Zamorakian forces. Bronze Zamorakian Token A bronze token from Zamorak. Silver Zamorakian Token A silver token from Zamorak. Gold Zamorakian Token A gold token from Zamorak. Small damage reduction from Saradominist forces. Runite Zamorakian Token A runite token from Zamorak. Small damage increase against Saradominist forces. Dragon Zamorakian Token A dragon token from Zamorak. Moderate damage reduction from Saradominist forces. Moderate damage increase against Saradominist forces. Players must collect divine tears for their side which must then be deposited at each side's respective camps. These tears will help determine which god is victorious. Tears can be obtained both on and off the battlefield. Tears can be found around the battlefield and must be mined, chopped, or netted. Killing opposing followers also yields tears for the player. Off the battlefield, Tears can be obtained from both combat and skilling, although this method is noticeably slower. Depositing Tears rewards the player with Renown as well as votes. 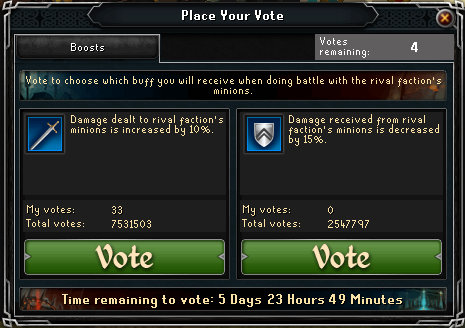 Votes can be used to determine the future battle plans. Renown can be used to purchase rewards from the quartermaster. Players can vote for an offensive or defensive strategy every week. While collecting tears on the battlefield, random events may occur that can either affect you or an entire faction at once. Saradomin curses the followers of Zamorak, decreasing their might for a short while. Saradomin has afflicted you with a terrible curse. You will deal 15% less damage to Saradomin's troops for the next three minutes. Zamorak curses the followers of Saradomin, decreasing their might for a short while. Zamorak has afflicted you with a terrible curse. You will deal 15% less damage to Zamorak's troops for the next three minutes. Saradomin has blessed his followers, decreasing their damage taken for a short while. Saradomin has blessed you. You take 15% less damage from Zamorak's troops for the next three minutes. Zamorak empowers his followers, decreasing their damage taken for a short while. Zamorak has blessed you. You take 15% less damage from Saradomin's troops for the next three minutes. Saradomin's blessing infuses his followers. Zamorak's zealous hatred infuses his followers with a singular purpose. Rockfall: Shadows appear at several battlefield locations and, after a few seconds, rocks fall and deal damage to players standing under said locations. 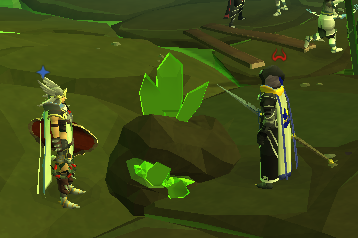 The rocks can be mined for Divine Shards , worth 30 Divine Tears each. You can only have one Divine Shard at a time. 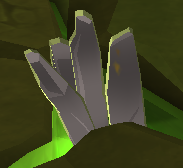 To mine more from the rocks, you have to deposit the shards. Game Message: Rocks are falling from the sky. Avoid them! Saradomin's obelisks are charging with a deadly energy. 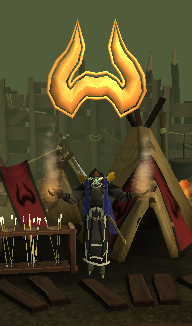 Zamorak's obelisks are charging with a deadly energy. Unstable Nodes: The colour of several resource nodes will change to orange or yellow for a small amount of time. Gathering resources from unstable nodes deals damage and grants no Divine Tears. Game Message: Several resource gathering points have become unstable. Be careful! Unstable Nodes 2: The colour of several resource nodes will change to a brighter green for a small amount of time. Gathering resources from unstable nodes grants three times more resources. Game Message: Several resource gathering points have become unstable. Be careful! Sacred Metal Nodes: The colour of several resource nodes changes to grey for a small amount of time. Gathering from grey nodes grants Sacred Metal fragments , used in cosmetic weapon creation, instead of Divine Tears. Game Message: Several resource points have turned to sacred metal. Saradomin's sharpshooters have joined the conflict. Zamorak's sharpshooters have joined the conflict. Saradomin's healers have joined the battle. Zamorak's healers have joined the battle. 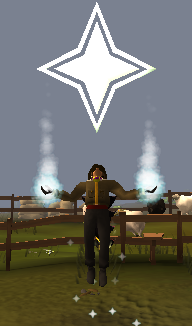 Saradomin's sapper has joined the battle. Zamorak's sapper has joined the battle. Saradomin's rogues have joined the battle to steal resources from Zamorak's forces. Zamorak's forces storm the field to steal resources from Saradomin. Saradomin has sent out a devout follower to gather resources for him. Zamorak has sent out a devout follower to gather resources for his army. Players can speak to each side's quartermaster to see possible rewards. New tiers of rewards will be unlocked as the battle continues. Armor scales up to 75 defense. New tiers will be unlocked as the battle continues. It isn't easy to perform damage control when you have two of the most powerful beings in Runescape duking it out on your doorstep. While Saradomin and Zamorak may not care where their battle is taking place, or what human hovels they destroy, the reality of the destruction they leave in their wake is a serious problem for the town of Lumbridge. The castle walls have very nearly been reduced to rubble, houses have been leveled, and the earth itself has been blasted into a sizable crater. Because of this, the Duke needs help defending and rebuilding Lumbridge and has been forced to dip into the town's emergency treasury. 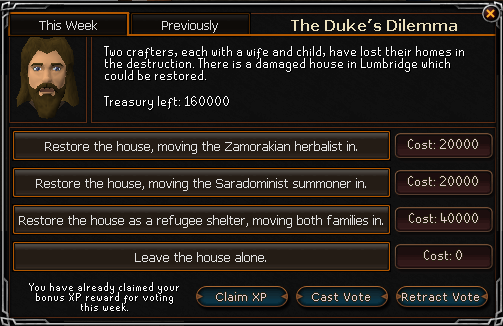 In order to ensure the most critical aspects of Lumbridge are preserved, the Duke is asking players interested in helping to vote for one of four choices each week, and whichever choice gets the most votes will be implemented, changing the face of Lumbridge forever. Players will be compensated with bonus experience in the skill of their choice for participating, but the allure of having a say in the fate of one of Runescape's most famous towns should prove to be the strong enough. 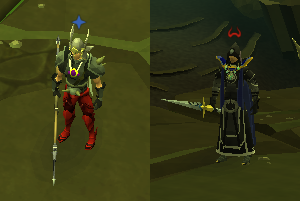 The battle of Zamorak and Saradomin clearly has implications beyond who will simply emerge victorious. Two crafters, each with a wife and child, have lost their homes in the destruction. There is a damaged house in Lumbridge which could be restored. We could expand our private army to help in the defence of Lumbridge, in case the fighting spills from the crater. We could request aid from our political allies in other cities. Our guardsmen are not currently up to the task of facing the knights and beasts if they leave the battlefield. Should we request magical protection for the town and castle?